If you have a dog you know they need to be groomed. While different breeds need to be groomed at more or less frequent intervals, all dogs need this important care. Breeds vary in their fur lengths, texture, thickness, and number of sheds. Be honest with yourself, if you aren’t up for the level of care a high maintenance breed presents that might not be the pet for you! 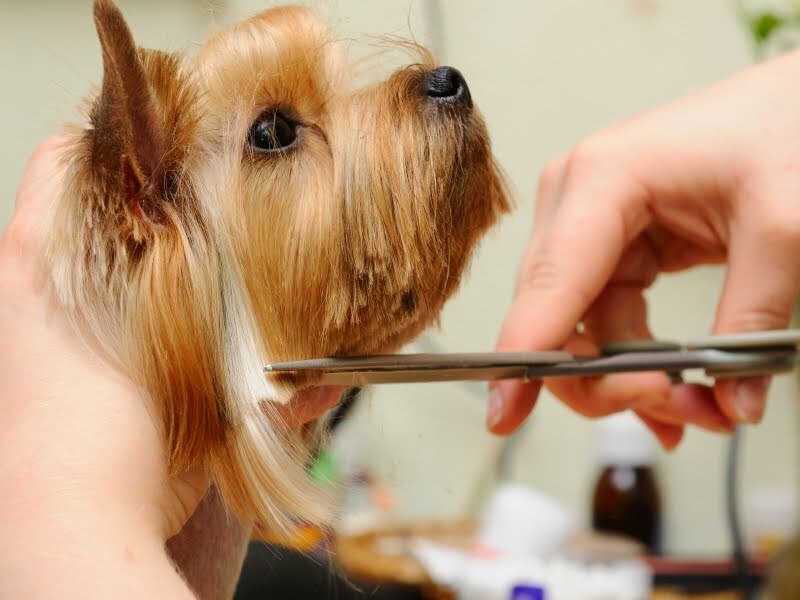 Grooming your dog is more than just aesthetics. Fur left uncared for can become matted and tangled. This fur can pull on a dog’s skin causing injury, and then need to be shaved. Dog’s fur can grow over their eyes making it hard for them to see, or for some breeds long enough to become a tripping hazard! This will also depend on the breed of dog you own. There are a variety of different brushes on the market. Dog’s coats typically have two types of fur: the outer layer of fur, which is coarser, and the inner layer of fur, which is much softer. A dog’s hair grows to a predetermined length, some stay short and some will grow quite long. Some of the most common brushes include: a bristle brush, a pin brush, and a soft or rubber brush. A metal comb for grooming is also a handy tool. You may also need a hound glove. Don’t forget equipment for taking care of their nails. Choose an organic dog shampoo for your pup’s bath. Not sure what to choose? Consult dog shampoo reviews. Dog bathing frequency will vary from breed to breed. Dogs with wiry coats need to be brushed at least three times a week to remove loose dead hair. These breeds can be considered high maintenance if you are going to take the time to properly brush them! These coats do best being washed about once every three months. Terriers and Dachshunds are breeds that belong in this category. Think poodles! Poodles should be bathed and trimmed every two months. Extra care needs to be taken dealing with extra fur in and around their ears, make certain you hire a professional to do your grooming. As you might suspect long thick coats require frequent brushing. In fact when these dogs are shedding they may need to be brushed daily. This breed of dog has a coat with protective oils. Too frequent bathing strips these oils which is detrimental to their coats. Choose a shampoo designed to care for your breed’s fur. Dog shampoo reviews can help you find just the right one. What is the dog bathing frequency for this breed? On average these breeds need baths only about twice a year. Akitas and Newfoundlands belong in this group. Use a hound glove to keep these pups looking great. A hound glove has a slicker brush on one side and rubber studs on the other. Comb these breeds once a week. Use dog shampoo reviews to find just the right shampoo for your dog’s baths. These breeds need a bath two to three times a year. Who falls into this category? Dalmatians, Dobermans, Boxers, Whippets, and Labradors! By knowing your breed you will know how to care for their fur coat! Each breed has unique challenges. Remember to use a trained professional groomer to get the best, most appropriate cut on your dog. Remember that the dog bathing frequency varies by breed. When it is time for a bath refer to dog shampoo reviews to find the best shampoo for your pooch. There are shampoos on the market tailored to different fur colors, protection against fleas, and a number of other concerns you may have. Spend some time researching your breed to make sure you are giving them the best care you can!